In the countryside, the boy Alan and his friend Becky steal a creepy wooden box with a powerful voodoo stick inside from his voodooistic neighbor. When the boy draws with the stick, his drunken father is attacked by a snake and vanishes. Years later, Alan and Becky are married to each other; while planting some flowers to celebrate the death of Alan's mother, Becky finds the box buried in the garden and she keeps the stick in her pocket. Meanwhile, five friends are traveling in a monster truck, drinking beer. The driver accidentally runs over Becky, but believes he had hit an animal. When Alan witnesses the hit-and-run and sees his wife dead, he uses the stick seeking revenge against the youngsters. Regions are unavailable for this movie. 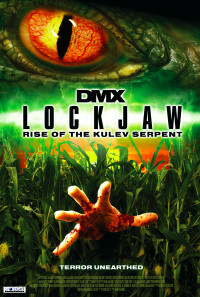 Click the "Watch on Netflix" button to find out if Lockjaw: Rise of the Kulev Serpent is playing in your country.